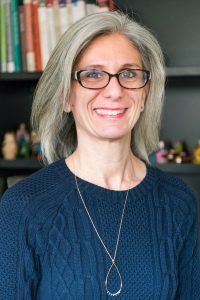 Denise Meringolo is a scholar-practitioner in the field of public history. She teaches courses in community-based public history practice, museums and material culture, and digital public history.She and her students partner with Baltimore Heritage, a local preservation advocacy organization, to develop content for the app Explore Baltimore Heritage, which allows users to take self-guided walking tours of Baltimore neighborhoods. Her book Museums, Monuments, and National Parks: Toward a New Genealogy of Public History (University of Massachusetts, 2012) won the 2013 National Council on Public History prize for the best book in the field. She is a member of the Long Range Planning Committee of the National Council on Public History. Denise Meringolo is the lead organizer and project editor of a collaborative study, Radical Roots: Civic Engagement, Public History, and a Tradition of Social Justice Activism. The project aims to identify new historical precedents for core values and practices that define the field, particularly those associated with civic engagement. The project will advance new critical perspectives on the ways in which those values and practices have been put to the task of advancing social justice, in the past and today. Denise Meringolo is the creator of Preserve the Baltimore Uprising, a digital collection project that allows individuals to gather and preserve images, videos, and stories about the protests that erupted after the death of Freddie Gray in police custody in April 2015. She received the prestigious Whiting Fellowship for 2018-2019 to activate the Preserve the Baltimore Uprising collection and promote community-based, collaborative historical reflection and interpretation. Click here and here to watch interviews with Professor Meringolo.